Most of the people attracted by the facebook website among the social websites. That's the one of the biggest website by having 700 and more accounts into it. As per facebook announced, 600,000 hacking's are occuring in accounts normally per day. During technology development nowadays easily all can hack the password from the account even we have it very strong. Lets see now how to reuse our account after hacked. There is an option in facebook. Using it, we can reuse the account easily after hacked. Are you being into the facebook now, just signout and come back. New dialogue box will be open as per shown below, after click this link. There is lot of facilities(like email, mobile number, friends name) to reuse your account into the window. As per your choice just choose it. Lets see an example using email. After give the email id, click the search button. 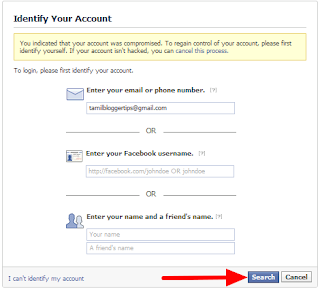 It will show one facebook account for which email id was given by you into the window. Type the old password which your account had before. After give password, click the continue button. 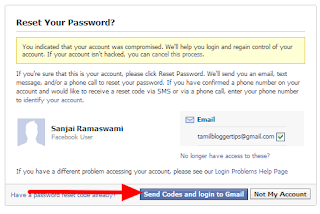 click the Send Codes and Login to Gmail button button in the newly opened dialogue box. Another one Pop-up window will be open. In it, Give your email id and password as correctly. Then it asks gmail permission, in it give Allow to the dialogue box as shown below. 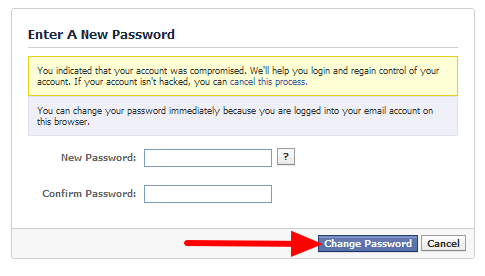 Give your New Password and click the change password button. As usual now you can use your facebook account. If you like this post please share with your friends on social networks.